Despite being a former French colonial hill station high up in the Annamite Mountains, Dalat isn’t a pretty city. Like Saigon, Dalat’s charms are in the details; one of which is the food. 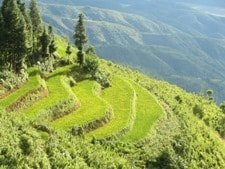 Dalat’s altitude and cool climate make it ideal for growing vegetables and this has earned it the epithet ‘vegetable garden of the south’. However, it was only after many visits to this mountain city that I began to discover local eateries and restaurants that are worthy of its reputation for food. 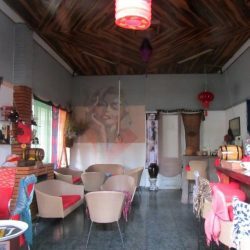 Part of the reason it took me so long to find good places to eat here is because, unlike the scorching lowlands where great food is served outside in full view of passers-by, in the chilly mountain climate of Dalat most places – street food included – are indoors, and therefore not always obvious from the street. 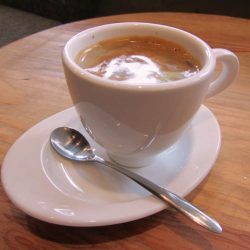 Dalat is also famous for its coffee, which is grown locally, and there are plenty of enticing cafes where you can try it. 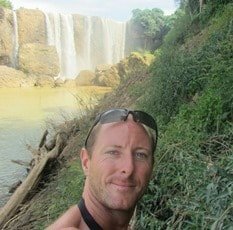 Below is my guide to eating and drinking in Dalat. 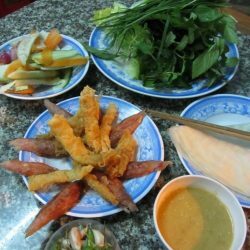 The following list of places to eat and drink in Dalat is in no particular order of preference. Click HERE to see my map. 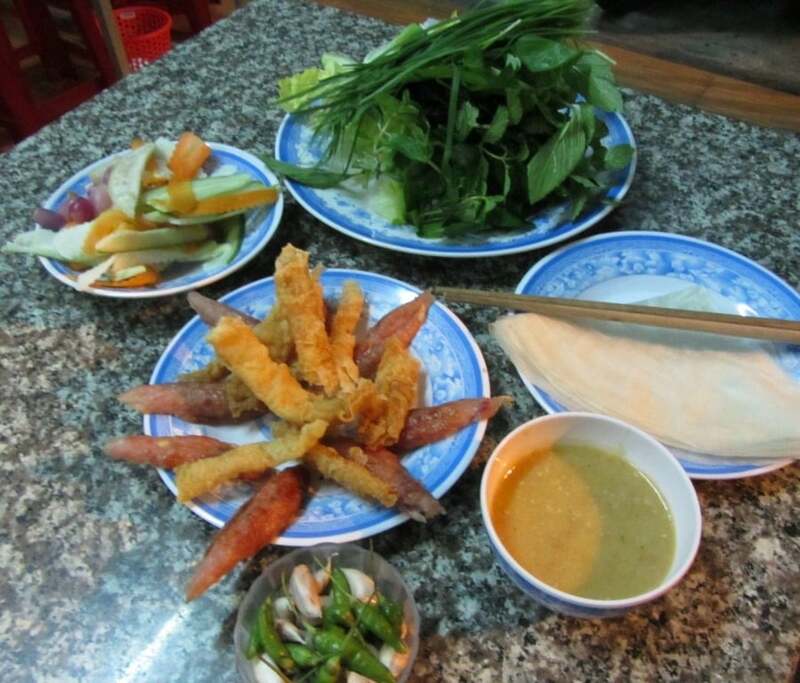 Dalat is one of a handful of places in Vietnam where nem nướng is a speciality. 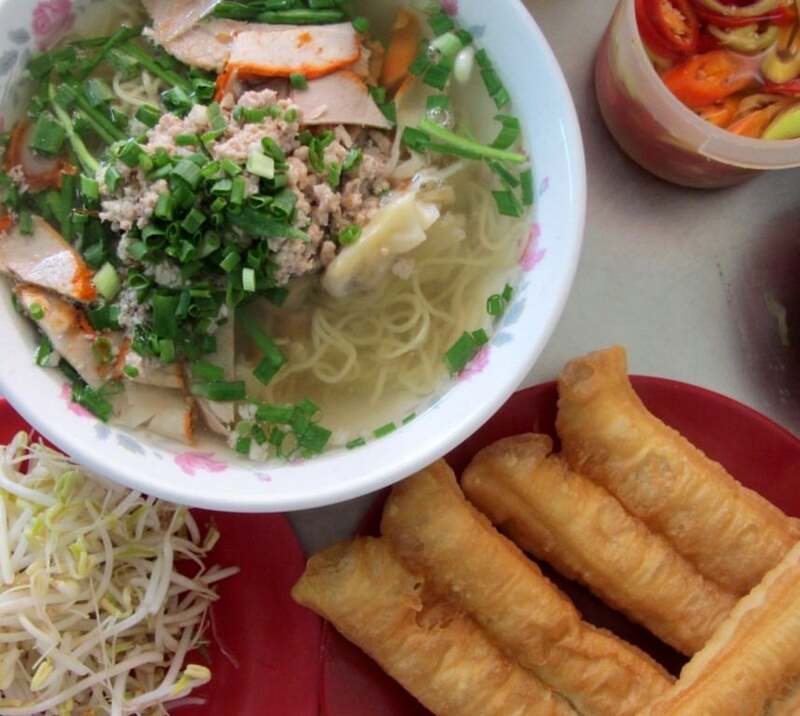 Nem nướng is a fresh, roll-your-own spring roll. Fill thin sheets of rice paper with a variety of herbs (including perilla leaf, sweet basil, chives, mint), add the nem nướng (grilled pork patty), then some chả ram bắp (crispy, fried sweet corn and rice paper rolls), pickled radish, carrot, and shallots, and roll it all up before dipping it in a thick, peanut sauce. Like all the best Vietnamese dishes it’s a brilliant balance of textures, flavours and colours. Nem Nướng Dũng Lộc is a small, clean, friendly and unfussy place on a quiet corner. I prefer this to the famous nem nướng giant of Dalat, Bà Hùng Restaurant, which is just around the corner. This local favourite is superb value at 30,000VND ($1.50): it doesn’t get much more ‘Dalat’ than this. 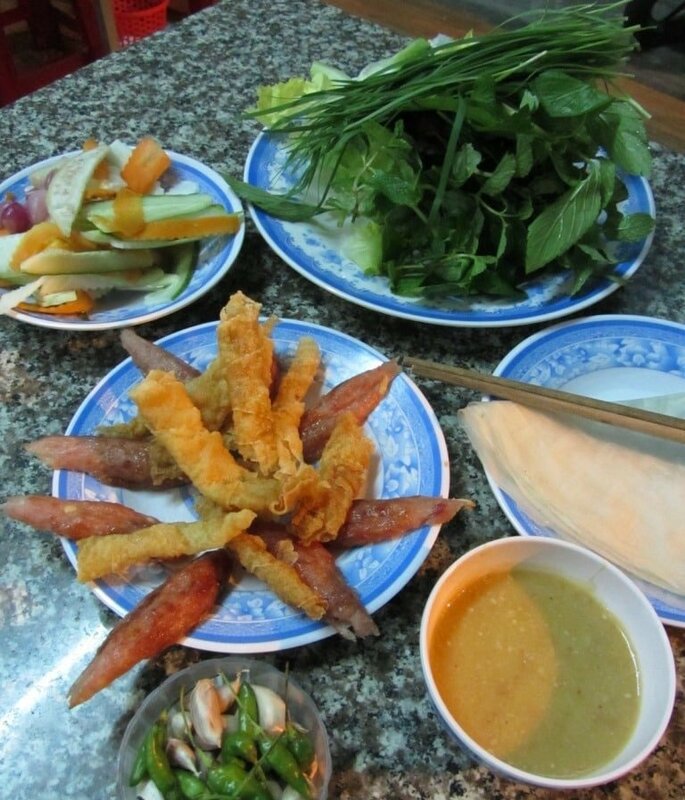 Dalat is full of nhà hàng chay (vegetarian restaurants), most of which are very average. 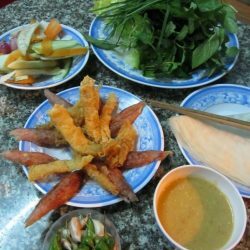 Hoa Sen Restaurant is an exception to this rule because of the variety of dishes on their menu and the delicious, colourful and fresh food. 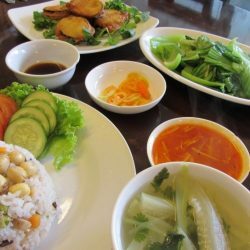 Unlike many of the other vegetarian restaurants in Dalat Hoa Sen doesn’t focus on ‘fake meat’ dishes. 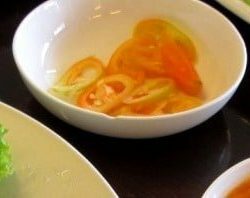 Instead, they use the fresh vegetables that Dalat is famous for and cook them simply and beautifully. My favourites are steamed mustard leaf with ginger, aubergine fried in a light ginger and lemongrass batter, and lotus seed rice. They also serve vegetarian versions of Vietnamese classics, such as phở. Anyone who thinks vegetarian food is bland should try dipping their food into the chilli and ginger sauce here to change their minds. The restaurant is big, bright and airy with wooden furniture. Prices here are very reasonable: 20-60,000VND ($1-3). 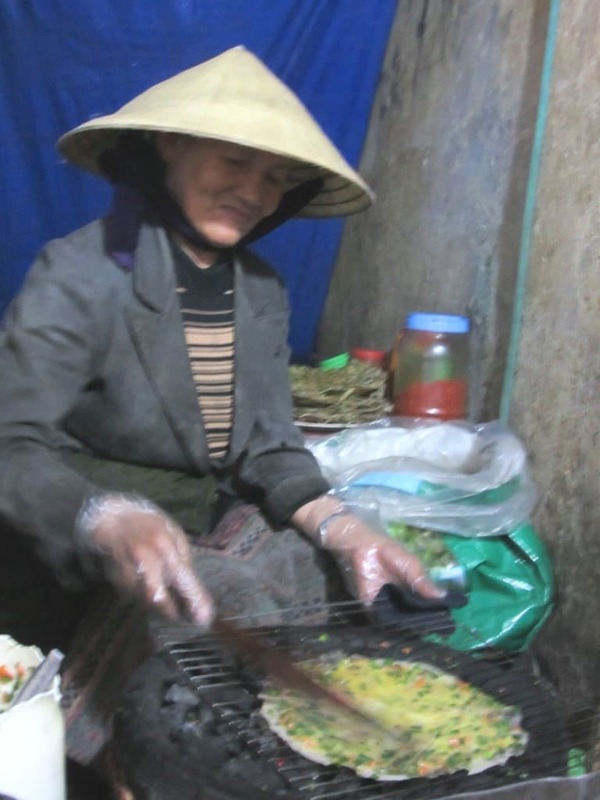 In the evenings, at the beginning of a narrow, dark alleyway between numbers 32 and 34 on 3 Tháng 2 Street, there’s an old woman in a conical hat sitting around a charcoal stove selling another Dalat favourite; bánh tráng. A Vietnamese friend once described this to me as the ‘Dalat pizza’: bánh tráng is a thin circle of rice paper with various ‘toppings’ on it that’s grilled over coals until crispy. It’s a popular snack all over Vietnam, particularly with children. Ms Tâm has been cooking bánh tráng for years in this spot. The dark, graffitied alleyway is warmed by her charcoal stove, lit by a naked light bulb hanging from a tarpaulin, and enlivened by passers-by stopping to exchange a few words with Ms Tâm before continuing on their way. The ‘toppings’ on Ms Tâm’s bánh tráng are simple but delicious; quail eggs, spring onions and tiny – almost tasteless – shrimp. Each one costs just 12,000VNĐ ($0.50). On cold Dalat nights, in the fine Dalat rain it’s warming and comforting to sit by the coal stove here – this is my first food stop whenever I visit Dalat. This is just the kind of place I love: totally unassuming – and unpromising to most western eyes, no doubt – but totally delicious, Mì Quảng Thành makes no effort to advertise itself from the street; people know the food here is good, and that’s all that counts. 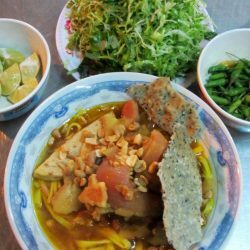 Mì quảng is a central Vietnamese dish but it’s also very popular here in the highlands. On its way up from the coast to the mountains the dish has changed slightly. One big difference is the gigantic pig’s trotter in the middle of this soup! This trotter has been slow cooked until the meat and fat are so tender they melt in your mouth. Part of what makes mì quảng so unique are the thick yellow noodles. However, in the mountains this noodle is usually replaced by a thinner white one. Fortunately, Mì Quảng Thành offers the choice of either of these noodles. 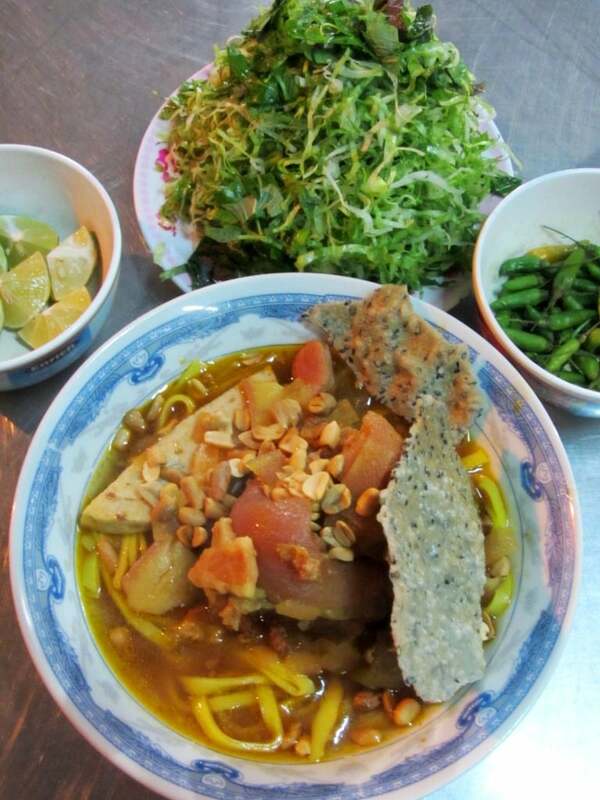 The broth is rich but not too sweet or salty, and the mint leaves, banana blossom and lime add crunch and tang to it. Very satisfying and cheap (30,000VNĐ/$1.50) Mì Quảng Thành is open from 4pm. Another central dish that’s made its way up to the highlands, bánh căn is served in many different ways, but here in the mountains it’s simple, straightforward comfort food. 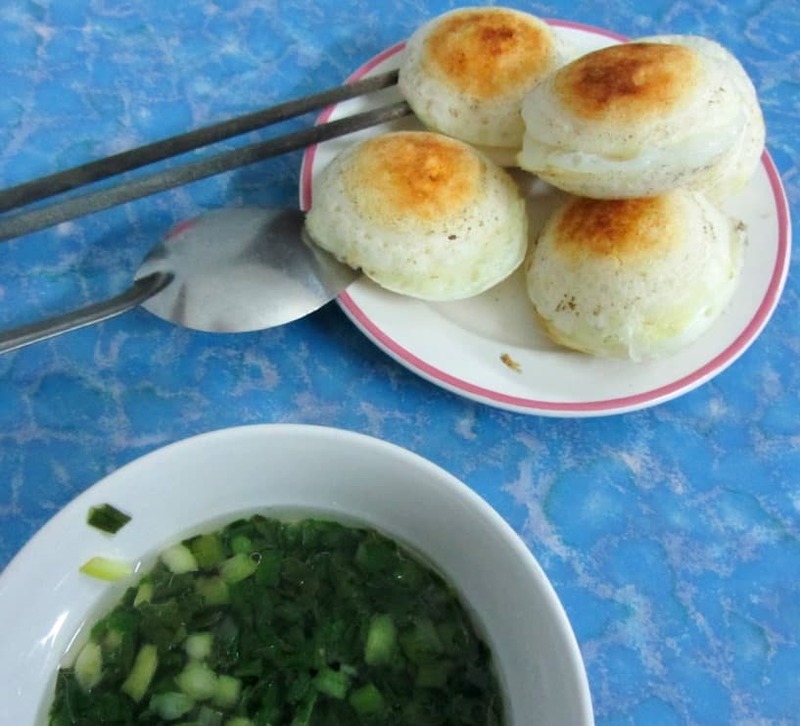 Bánh căn are little rice flour cakes cooked in small, round ‘pods’ over hot coals. A quail egg is dropped in the middle and sprinkled with spring onions. Once cooked these little cakes are crispy on the outside with a bubbly, spongy consistency on the inside which makes them perfect for absorbing the salty-sweet dipping sauce. 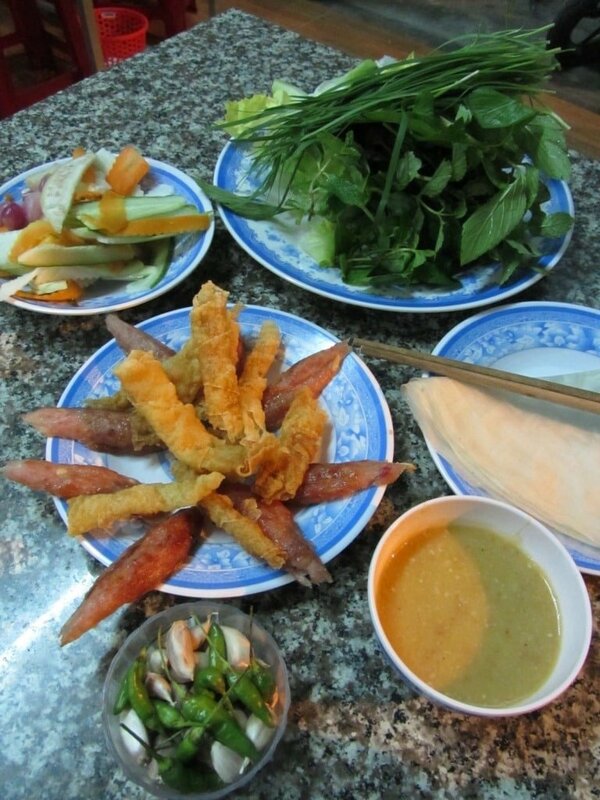 Bánh Căn 14 is a small, brightly lit hole-in-the-wall place that opens from around 4pm (20,000VNĐ/$1). 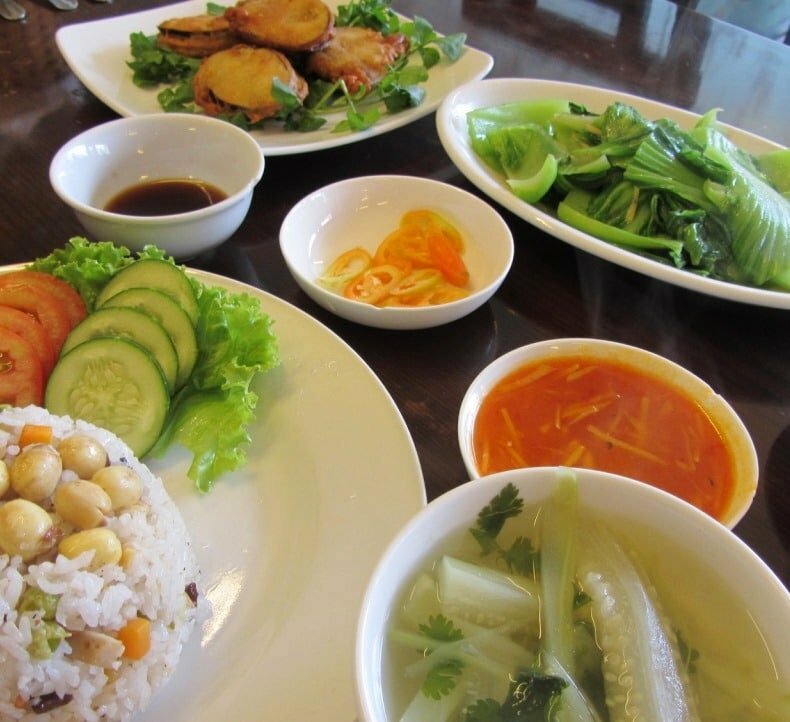 This is a great place for a Chinese classic that’s popular all over Vietnam. 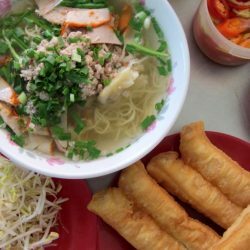 Mì hoành thánh (wonton noodle soup) is an egg noodle soup with pork dumplings, ground pork and pork slices in a sweet, clear broth. This is another hearty soup for those cold, grey Dalat days. Tiệm Mì Tàu Cao is a small, busy place that’s open to the street. It’s open all day but gets particularly busy in the mornings when locals dressed in heavy coats huddle over their steaming bowls for warmth. The price for a bowl of soup is 40,000VNĐ ($2). 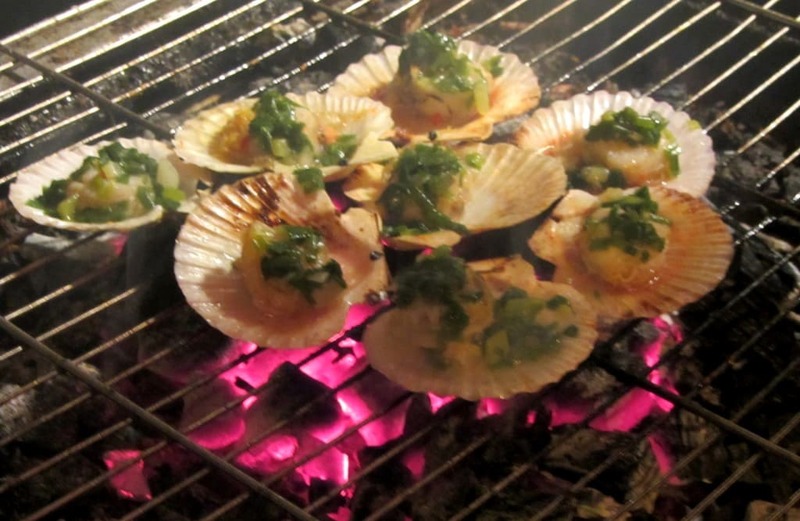 Eating snails and shellfish and drinking beer is a popular night out for many Vietnamese. 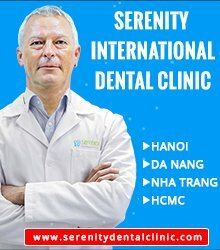 Ốc Nhé! has a large menu of snails, cockles, clams, scallops and oysters, most of which are grilled over coals on the sidewalk. This place attracts a young crowd and prices are higher than other eateries in this list (40-60,000VNĐ/$2-3 a dish). 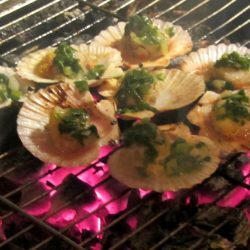 Try the steamed clams with lemongrass and chilli, and the grilled scallops with peanuts and onions. Read more about eating snails on VietnamCorcacle.com HERE. 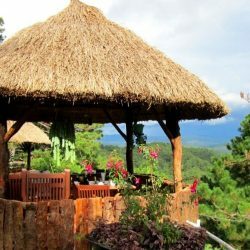 This café, restaurant and bar is located on a quiet corner under an avocado tree near Dalat’s ‘backpacker’ area. In a cool, relaxed environment – similar to the more bohemian of Saigon’s trendy cafes – Café 13 is a nice open space with a bright interior and a leafy patio with potted plants and flowers. Portraits of famous sportsmen, musicians and movie stars adorn the walls, and secondhand books lie on tabletops. 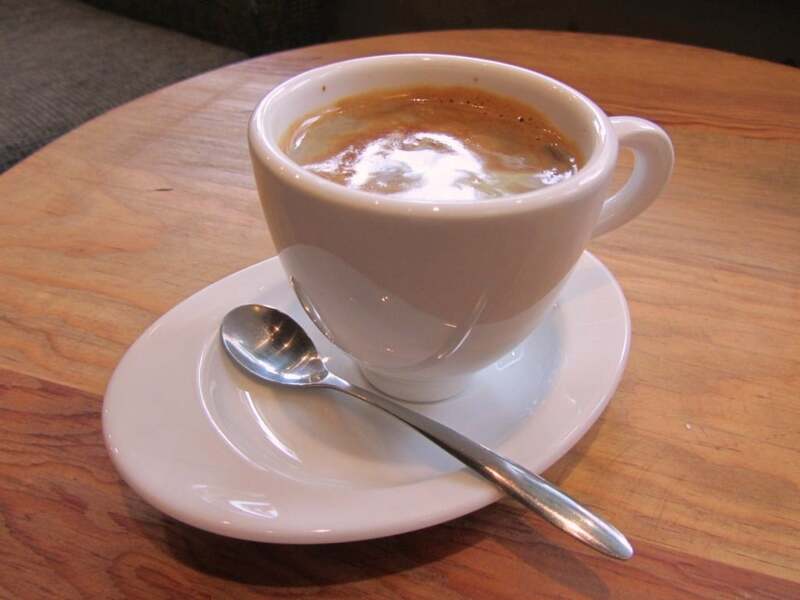 The coffee is sweet and rich, and the menu here includes some western favourites for those missing the comforts of home. At night fairy lights and lamps illuminate the patio, decent music is played, and good alcoholic drinks are available. 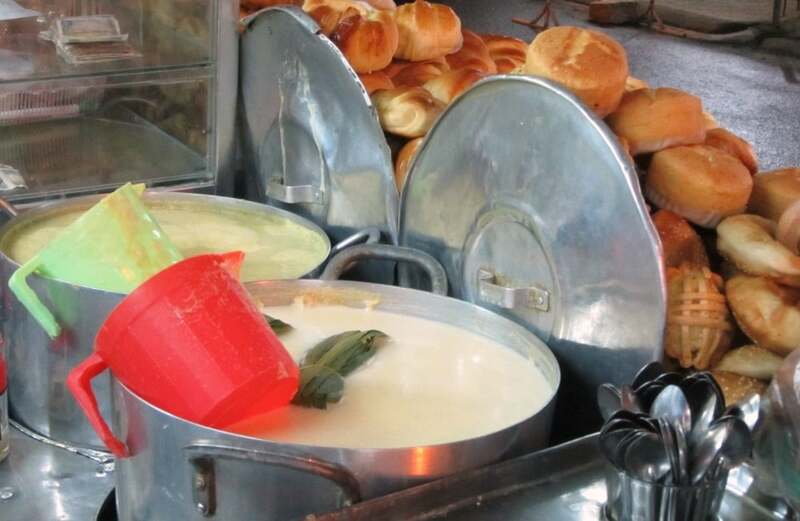 Prices for food and drink are between 30,000-100,000VNĐ ($1.50-$5). This is a real ‘old time’ café: a small place open on two sides, a tiled floor, a half dozen little wooden stools and tables, with mostly older men smoking, chatting and reading newspapers: no Wi-Fi here! Hot, chocolaty coffee (8,000VNĐ/$0.50) is served in tiny shot glasses with a pot of jasmine tea on the side. It feels like it’s been open for generations and, judging by the steady flow of customers, it’ll continue for many more years to come. 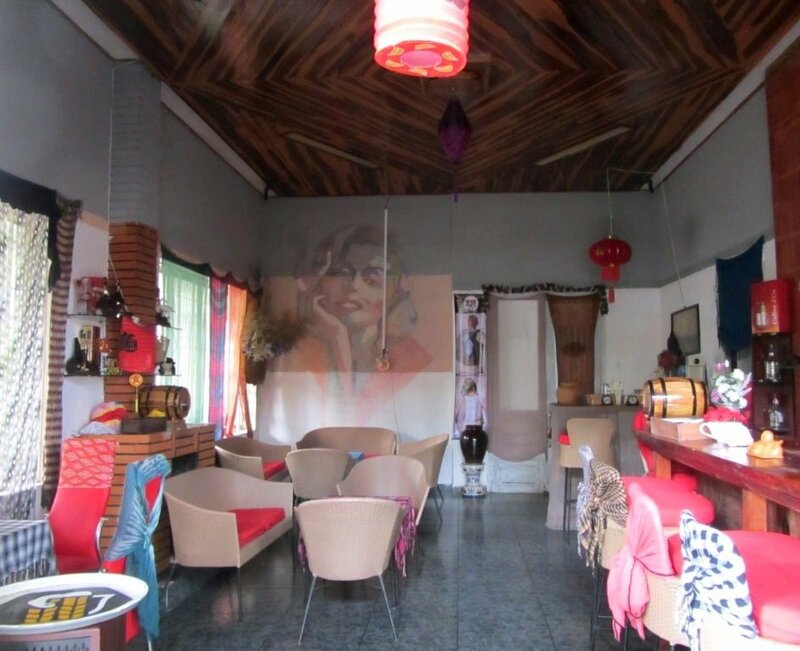 It’s interesting that many of the new ‘youth’ cafes in Vietnam’s towns and cities seem to have taken their cue from ‘old time’ cafes like this one: adopting the low wooden stools and chairs and making them trendy and contemporary. Windmills now has 3 locations in Dalat and over the last few years they’ve deservedly gained a reputation among tourists and locals for good quality western-style coffee and cake. Staffed by young Vietnamese (often students at Dalat university) all the Windmills outlets have a friendly, youthful and bright ambience. The décor is comfy, cutesy and very ‘Dalat’ – wooden chairs and floorboards, colourful cushions, pretty flowers in vases, peppermint-green and white awnings, and smart lamps. 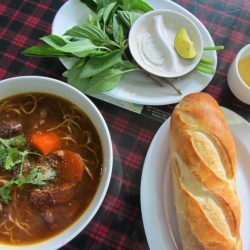 The menu is chalked up on a blackboard in swirling writing next to sketches of some of the items and famous Dalat landmarks. Coffee here is excellent and reasonably priced (20-40,000VNĐ/$1-2). 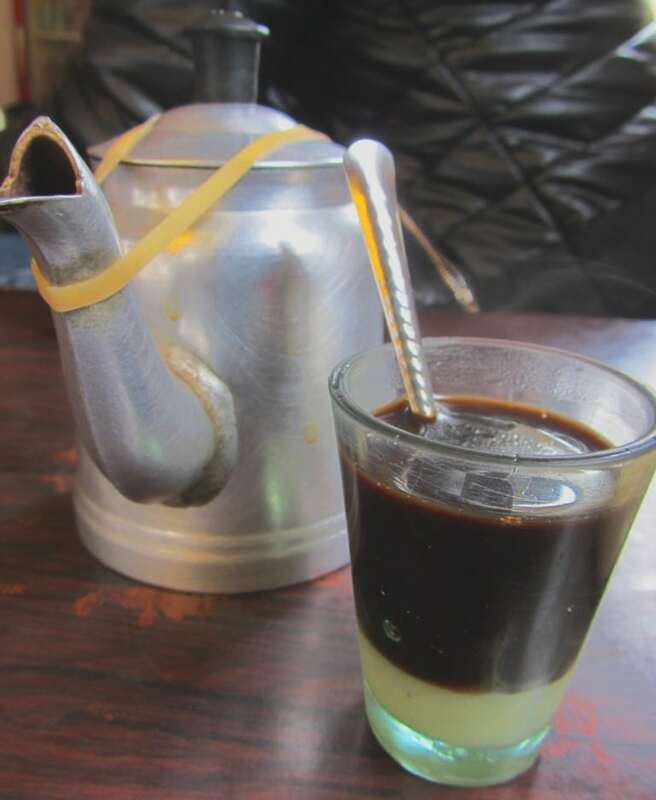 Like most coffee shops in Dalat Windmills uses coffee grown locally in Lâm Đồng Province, but the difference is that Windmills uses the arabica bean which has a smoother flavour than the bitter robusta bean that most other Vietnamese coffee shops serve. Despite being a chain Windmills retains the intimacy of a local café; let’s hope they don’t expand too much and end up losing this vital quality. (Wednesday and Friday nights at Windmills No.7 3 Tháng 2 Street there’s an acoustic ‘jam’ session where anyone can join in). 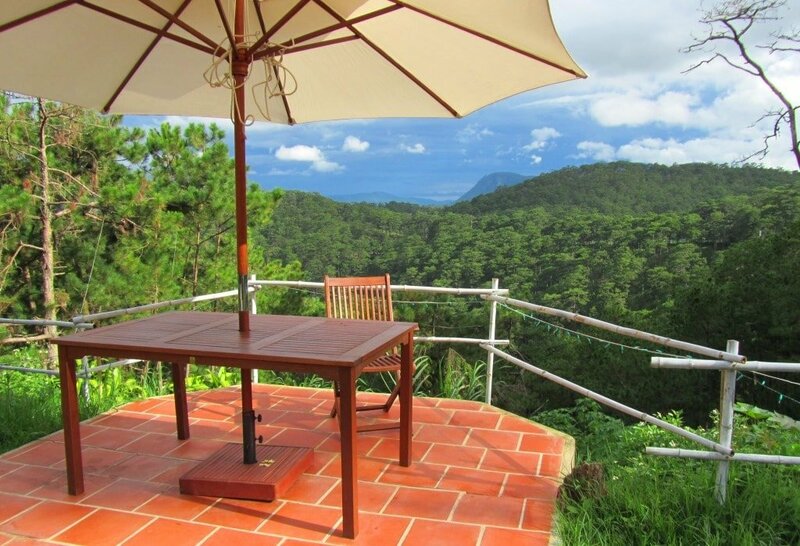 Dalat lies in the middle of a beautiful landscape of pine-forested mountains, but there are very few places in the city where you can glimpse the natural surrounds. 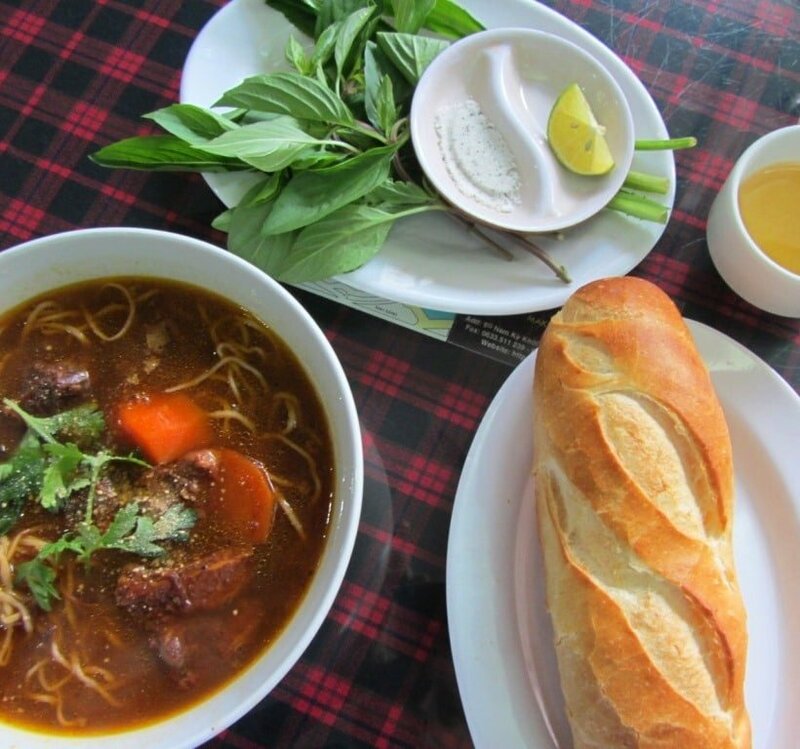 Cafe Ngoại Ô is located at the top of the Prenn Pass just as you enter the city limits. 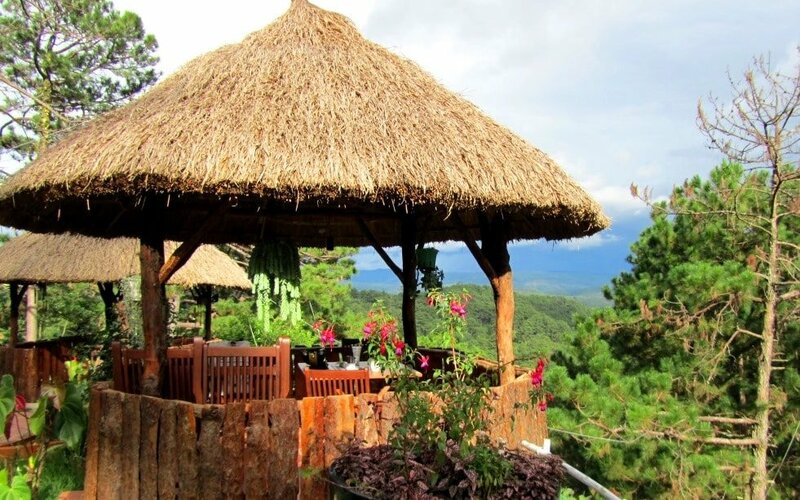 From the seats in its garden and log cabins there are views over pine forests, mountains and valleys. Mid afternoon till sunset is a great time for a strong coffee (20,000VNĐ/$1) while watching the light play across the landscape. 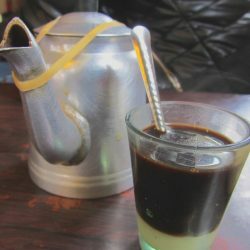 This place serves a variety of warming drinks for those cold Dalat nights: hot soy milk, green bean ‘brew’, and peanut ‘coco’. The latter is a bit like drinking smooth peanut butter but without the sweetness. There’s a selection of little pastries to dunk in your hot drink. Quán Hoa Sữa is not much more than a hole-in-the-wall but there’s usually a good crowd here sitting on the tiny plastic stools on the pavement from sunset. Drinks and pastries are very cheap: 5,000VNĐ ($0.25). This café and restaurant is housed in the old French post office. It’s a superb building in a great position in the middle of an intersection which I call the ‘French Triangle’: to the south is the Hotel Du Parc, to the west the French cathedral, and to the east the grand old Dalat Palace Hotel. 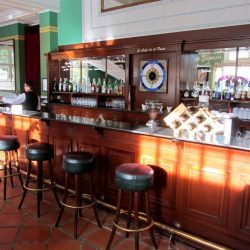 Inside there’s plenty of colonial charm: wooden booths with padded seats next to stained glass art-nouveau windows, a grand bar, chandelier, and black and white photographs of turn-of-the-century Dalat. Late afternoon on a sunny day is a good time for coffee and cake outside, when the sun sets behind the pink cathedral flooding the triangular patio with fresh, clean, clear, warm Dalat sunlight. However, there is something cold about this place: service is shaky, prices (100-300,000VNĐ/$5-15) are far too high for the quality of food and drink, and there are rarely any customers. What’s more, they play terrible instrumental arrangements of sentimental pop songs in the bar – I can’t think of anything more at odds with the general ambience of this café. 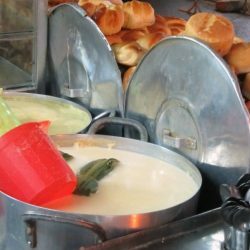 This entry was posted in ALL, Central Highlands, Dalat, DESTINATIONS, FOOD & DRINK, Mountains, Street Food and tagged Dalat, drink, eat, food, guide, Vietnam, where. Bookmark the permalink. Thanks for sharing! I am visiting Dalat end of next year. Is the weather cold during the end of next year? It can be quite cold during the evenings at that time of year, but the days should be nice and warm. December to April is are my favourite months to visit Dalat. 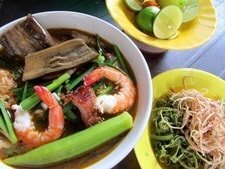 What an awesome guide on what to eat and drink in Dalat. I’m exciting to try it out when I’m there in a couple weeks! My cousin is currently opening a strawberry farm in Dalat and I will definitely forward this info his way 🙂 Keep up the good work! Thanks! 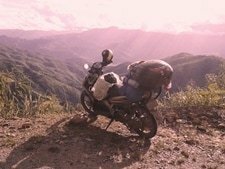 It’s really good to hear that you’ve enjoyed following some of my guides around Vietnam. Great list, thank you! I’m heading to Dalat for the first time in the new year. 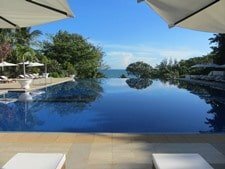 It’s my mum’s birthday while we are there so I was wondering if you had any suggestions of where I could take her – somewhere where we could experience the best of the local food with good service and preferably with a nice view of the lake. If you have any recommendations that would be great! I’m afraid most of the places in this list tend on the side of street food or, at the very least, ‘informal dining’. They are all very local and very ‘Dalat’, not to mention very tasty 🙂 But perhaps they don’t really fit the bill for a special birthday dinner. I’m afraid I’m less well-informed about ‘proper’ restaurants, although I know there are supposed to be some very good ones in Dalat. 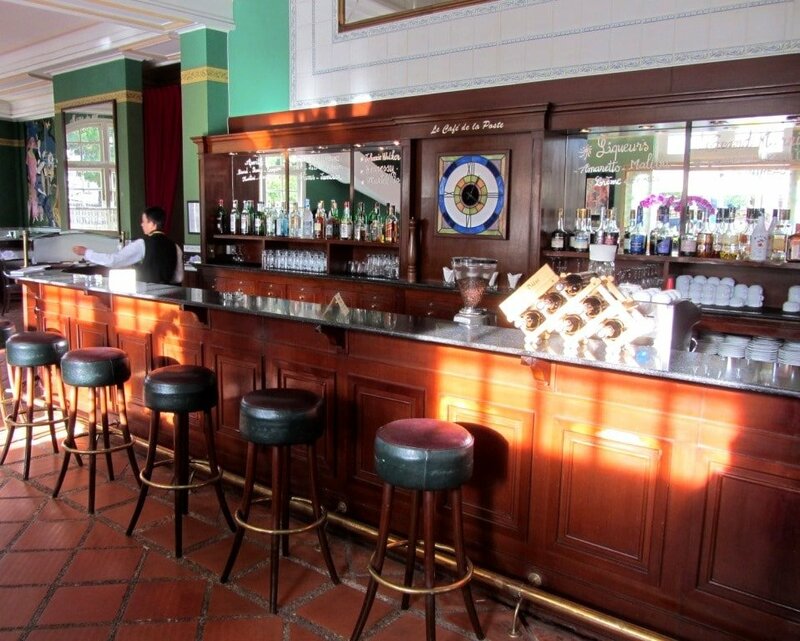 I suppose the restaurant at the Dalat Palace Hotel would be such a place: it’s a grand old colonial setting looking over the lake, but the menu is mostly French cuisine. 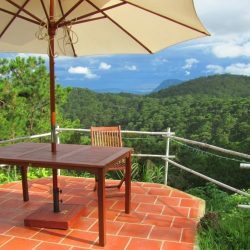 I have some friends in Dalat whom I can ask, but you might also want to consult some of the reputable travel guides too – Lonely Planet and the Rough Guide will have some suggestions, for example. Cafe 13 is underrated. The old couple that run this place are absolutely brilliant. Great suggestions, thanks very much! Sadly as of November 2016, Mì Quảng Thành is closed down. I tried to go there this week, but I walked around the corner to Long Hoa instead. Thanks a lot for the update. I want to update this whole guide soon, but haven’t had the chance yet. Oh dear. I’m surprised it was tasteless – that bowl is usually full of flavour. Perhaps it’s a different cook now. I’ll go and have a bowl next time I visit. 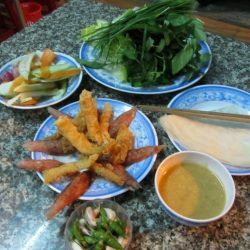 Nem Nướng Dũng Lộc was fantastic! i cant wait to visit these places! Thanks. I hope you like them! 1.Home cafe on Cô Giang street (an amazing narrow street with some cool old buildings) is a good place for a relaxing rainy afternoon in Dalat. It has a big garden with lots of flowers especially orchids. 3. Try taro/sesame/soy/mung bean.. milk at a small stand opposite to Thanh Thế hotel (118 Phan Đình Phùng street), this place has a best milk I’ve tried so far in Dalat as I could taste the true taste of beans instead of a very bland taste of “hot water and condensed milk” like many other places. 4. Cơm tấm không tên at the end of Phan Đình Phùng street, keep going straight (if you turn right it is Xô Viết Nghệ Tĩnh street): I’ve never tried cơm tấm there but instead bún thịt nướng. There’re many eateries around this area. The food is cheap but tasty :). I’ll try to give them a try next time I’m in Dalat. 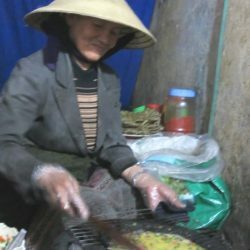 Hi – wanted to let you know that both Bánh Căn 14 and Ms Tâm’s Bánh Tráng appear to be no more. The former was gated with no sign of life in quite awhile and the latter was an empty alley. I figure she might have taken the night off, but there was apparent piles of old garbage in the alley. I double checked the address of both to be sure and am pretty sure we were in the tight place. Just thought you might want to update your post. Thanks for the info. Thanks a lot for letting me know. I happen to be in Dalat today so I will try to drop by and have a look for myself. I think Ms Tam is still there – she’s probably just taking her Lunar New Year break! As for the Banh Can, try Banh Can So 7 at 22 Tang Bac Ho street instead, it’s right next to the old one. Cafe Ngoai doesn’t exist anymore it has been taken over by another cafe that has food. Thanks for the update. It’s in a great position so I’m glad it’s still there in some form or another 🙂 I look forward to checking it out the next time I’m up in Dalat. Went to Bicycle Cafe for coffee today. Cool little cafe tucked in the entrance to the lane at 82-B Truong Gong Dinn 2 Dalat. Art Studio Media Wedding nearby as a reference point.